Power Boat - Tidal Trails - Open Year Round! Our comfortable six passenger boats are the perfect platform to sit back, relax and see Kiawah from a different perspective. Enjoy an intimate tour of our beautiful barrier islands with friends and family. Our U.S.C.G. licensed captains are delighted to share their knowledge and experience with you as you explore the remote tidal creeks and waterways and enjoy the abundant wildlife and beautiful scenery of the Lowcountry. All ages are welcome. Participants under 18 must be accompanied by an adult. Take a leisurely Sunset Cruise and/or Cocktail Cruise and enjoy this tranquil time of day. Watch the wildlife settle down and the skies illuminate the ever-changing saltmarsh. 2 hour tour. The whole family will enjoy a Family Fishing Excursion. This includes a boat ride, dolphin watching, crabbing, throwing a cast net and fishing. 2-3 hours. Half day inshore fishing trips – fish for redfish, sea trout, sharks and flounder. 4 fishermen maximum – 3 hours. 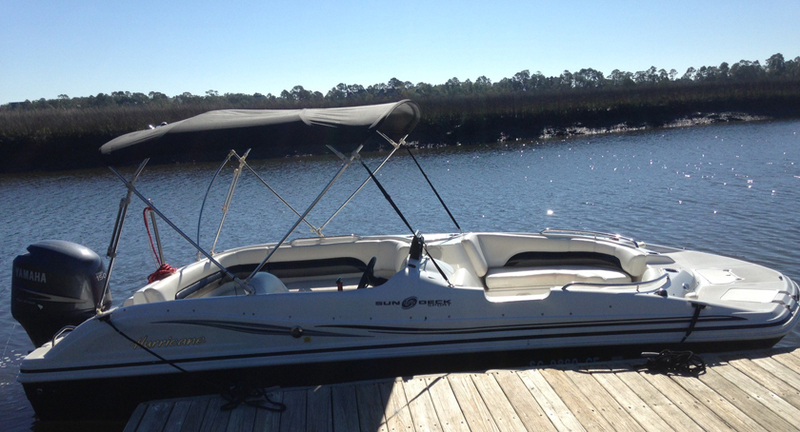 Enjoy a scenic cruise on the Kiawah River to Captain Sam’s Spit. Search for wild dolphins and learn about their behaviors and habitat. This area is known for dolphin strand feeding. Allow 3 hours. Cruise Charleston Harbor to view beautiful historic homes along the Battery and our unique skyline. Allow 3 hours. ALL TOURS INCLUDE LICENSED U.S.C.G. CAPTAINS, BOAT, FUEL, COOLER AND NON-ALCOHOLIC DRINKS. Prices are subject to change without notice. Please note that gratuities are not included. Kiawah Island is a private gated community and is restricted to KI property owners and property owner guests only.